Rice husk is one of the most abundant agricultural wastes in Indonesia, with an annual potency of 13,662 MWe. Using biomass gasification, it can be converted into producer gas, whose energy can be used for thermal and electrical power generation. In gasification terms, gas quality can be interpreted by tar content and gas energy. An experiment using an open top fixed bed downdraft gasifier (batch system) with double stage air supply was conducted by varying the secondary air injection position (Z) and the air ratio (AR). Tar content can be represented by flaming pyrolysis duration and gas quality by the combustion energy of the gas. Flaming pyrolysis is a phenomenon which occurs inside the reactor, where tar produced is re-cracked and dissolved into smaller compounds. This can be achieved if the pyrolysis zone temperature ranges between 500 and 800oC. With an AR of 80%, at Z = 38 cm, flaming pyrolysis with the longest duration of 400 seconds was created, which indicated that this condition had the lowest tar content; meanwhile, at Z = 50 cm, gas with the highest energy (734.64 kJ) was obtained. Rice husk is one of the agricultural wastes in Indonesia with the largest annual potency (21,114,074 tons/year), equal to 13,662 MWe of electrical power (ESDM, 2013). One of the common methods to harness its energy is biomass gasification. 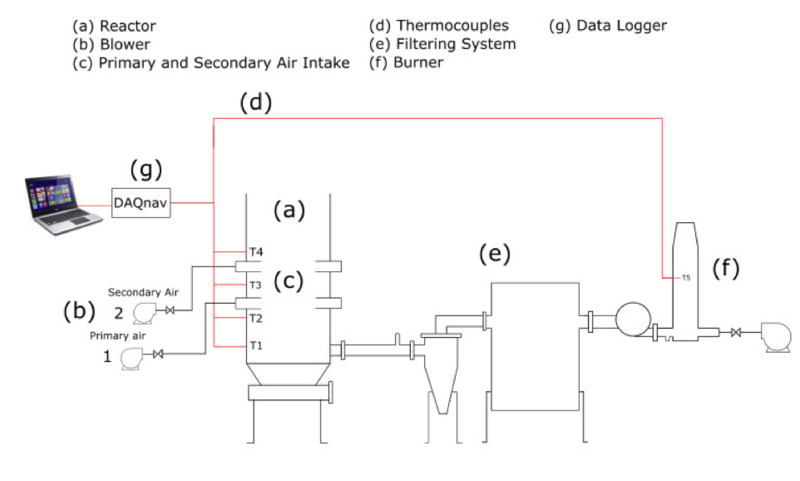 This is a thermochemical process to convert solid biomass (rice husk) into synthetic gas, which can then be used for thermal and electrical power generation (Basu, 2010). However, utilizing its energy means that the gas quality has to meet certain standards. In gasification terms, these standards can be interpreted as tar content and gas energy. They are important, especially for power generation, when most engines cannot operate if certain amounts of tar are contained in the gas. Tar is a residue in the gasification process; it is a brownish-black liquid poly-aromatic hydrocarbon, which presents in a spray form carried away by the gas. Gas with high tar content usually damages engines, pollutes the environment, and lowers gas energy. Consequently, methods for tar reduction in syngas (synthetic gas) have become one of the most important topics in biomass gasification research (Yoon et al., 2012). Gasification consists of four thermochemical processes: oxidation, reduction, pyrolysis and drying (Basu, 2010). In this paper, the pyrolysis process is highlighted because of its role in producing tar, waste that can be harmful to the environment and the gasification equipment itself. Moreover, tar can be destroyed by increasing the pyrolysis temperature in order to create a phenomenon called Thermal Tar Cracking. Thus, optimizing the pyrolysis zone could be a promising way to reduce tar content. The tar content in the gasification process should be below 5 mg/Nm3 (Basu, 2010). Research conducted in this field includes: (1) An experiment using coconut shell, wood and rice husk which produced a pyrolysis temperature of 103.97-141.64oC (Wicaksono, 2013); (2) Grate modification and stirrer and overflow addition, which created a pyrolysis temperature of 614.56oC using rice husk as the biomass fuel (Achiruddin, 2014); and (3) Appropriate ER selection, which produced an optimal pyrolysis zone with a stable temperature (500-600oC) for an operating time of 60 minutes (Dafiqurrohman et al., 2016). One way to optimize the pyrolysis zone is to add more air supply stage to the reactor. Furthermore, in this paper a small scale downdraft gasification reactor fueled by rice husk was installed with a double air supply. The downdraft type was chosen because of its efficiency to reduce tar and because air supply is implemented to achieve a higher temperature in the pyrolysis zone. The addition varied from secondary to tertiary air (Galindo et al., 2014; Guo et al., 2014). By appropriate Air Ratio (AR) selection, air could be transferred into the pyrolysis zone so that flaming pyrolysis could be achieved. Consequently, more heat was used to crack the tar and its content inside the syngas was able to be reduced to the lowest level possible (Martinez et al., 2011). Several researches have been conducted in relation to this topic, with the following findings. Based on these references, the research objective of this work is to find the optimum Air Ratio (AR) between the secondary and primary air supplies, and the optimum height (Z) of secondary air intake to produce syngas with the highest energy and lowest tar content. The optimum Air Ratio (AR) of the secondary air stage gasifier was 80%, at which the longest flaming pyrolysis was achieved and the highest combustion (gas) energy was obtained. The optimum pyrolysis zone was achieved at AR 80% with Z = 38 cm, with the longest duration of flaming pyrolysis of 390 seconds. In this condition, the Z/L was 0.633, which agreed with the Blasi experiment range, i.e. 0.6–0.65. The highest gas energy was 734.64 kJ, achieved at AR 80% Z = 50 cm. For the Z values of 34 cm, 42 cm, 46 cm and 50 cm, as the AR increased, gas energy also rose. As AR became higher, due to the reaction equilibrium, more air would flow to the oxidation zone rather than the pyrolysis zone. As a result, more energy was transferred to the reduction zone to produce CO and H2, resulting in higher gas energy. At Z=38 cm, the maximum gas energy was achieved at AR 50%, when no flaming pyrolysis occurred, and decreased gradually from AR 60% to 80%, which both produced flaming pyrolysis. This was because the secondary air was injected directly into the pyrolysis zone (Z = 38 cm) so that more of this air would be used for creating flaming pyrolysis, rather than being supplied to the oxidation zone. In this position, the greater the quantity of air (higher AR), the more stable the flaming pyrolysis. The addition of secondary air increased gasification efficiency in terms of energy produced. At the 60o primary air valve opening, the energy produced was 306.1 kJ. With the same amount of air, AR 60% could produce gas with total energy more than twice as high. In most conditions, the secondary air reduced the flaming pyrolysis duration, instead of increasing it. Meanwhile, for appropriate parameter (AR and Z) selection, its duration could be increased slightly, as Z = 38 cm with AR 80% duration was 390 seconds, and primary 45o was 355 seconds. This was probably due to the batch system used in the experiment. Further analysis could be made by conducting a continuous gasification system test. Finally, it is also important to notice that flaming pyrolysis only served as a representative parameter of tar content inside the produced syngas. It could not accurately reflect the amount of tar, since several different phenomena affect tar production. Therefore, the effectiveness of secondary air in reducing tar content should be validated by conducting tar measurement experimentation. The authors wish to thank the Indonesia Ministry of Research, Technology and Higher Education for funding this project with grant number 2724/UN2.R3.1/HKP05.0012017.